I've written here before about Shining Stones- an Etsy store with some truly gorgeous jewelry. I subscribe to the newsletter for this store (you should too- newsletter subscribers get a discount on the pretty jewelry!) and last month noticed a comment in the newsletter. It was telling us that there were several giveaways going on in the blogosphere- giveaways of jewelry and gift certificates to Shining Stones! As a general rule, I don't enter many giveaways anymore, unless it's for a prize that I really want. I entered every single giveaway that was listed on that newsletter. And I won one of them! I chose this bracelet- The Thank You Bracelet. Isn't it gorgeous? It's even prettier in person, believe me. 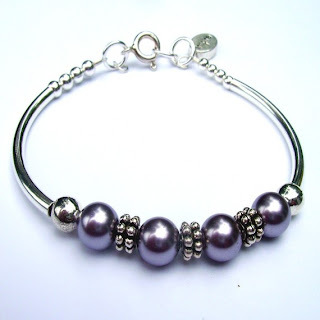 This bracelet is made with swarovski pearls and sterling silver findings. You can choose your color of pearls for the bracelet- I went with the lavender, as pictured above, but you can also get it in rose or pale blue. If you look near the clasp, you can see another thing that I think is a great touch- the message charm. My charm says "faith", but you can choose many other words like believe, peace, hope, inspire... or many more! This bracelet sells for $38 (less if you have the newsletter subscriber discount! ), which is a really good price, I think, for such a pretty, high-quality piece of jewelry. Shining Stones also has a great selection of other bracelets, necklaces, earrings and rings. There are some really beautiful pieces at this shop- you definitely need to pay it a visit. If you do buy something, will you tell Ellie that I sent you? At checkout, just put this code: REFER11 in the message to seller box, along with my name and email (Carrie- growingababyreviews@hotmail.com). This will also make you eligible for the 20% discount (and this shop has free shipping! )- just click "other" on form of payment, and you will receive an invoice reflecting the discounted amount. Disclosure: I won a gift certificate, which I used to get this bracelet, in a giveaway at another blog. I was not compensated for this email and all opinions expressed here are mine and mine alone.